Sherlock Holmes vs Cthulhu, the ultimate showdown! 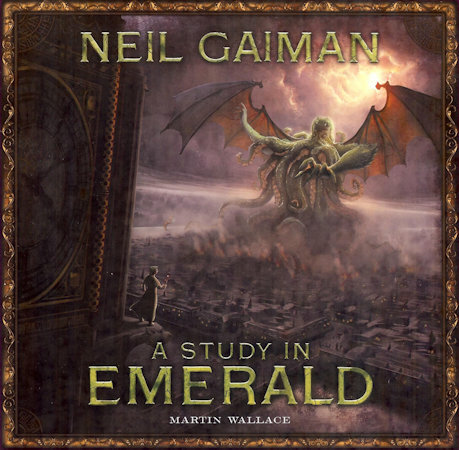 This is the selling point of A Study In Emerald, the game by Martin Wallace, if not quite the plot of the Neil Gaiman short story. A little background is necessary. In 2003 there was a short story collection called Shadows Over Baker Street. In it, 18 different authors mash together Arthur Conan Doyle’s Sherlock Holmes and H.P. Lovecraft’s Cthulhu mythos in a nightmarish alternative history. Neil Gaiman wrote the first story in the collection, beautifully introducing the concept and twisting the reader about like a confused puppet. His story, which won a Hugo Award, is available as a free PDF from his website and is worth a read if you’re a Sherlock fan – the style and in-jokes are clearly targeted at fans of Doyle rather than Lovecraft. Then, in 2013 and again in 2015, Martin Wallace turned the concept into a game. I have the 2nd edition which I’m told simplifies the chicanery of the 1st, but remains a fascinating and unusual game. Humanity has been enslaved by the Great Old Ones and battle ensues between two factions that seek to either serve or overthrow their monstrous rulers. Each player sends agents (and occasional zombies) around the world to influence fictional and historical figures, from Freud to Otto von Bismark to Sherlock himself. These figures become cards in a growing deck held by each player, opening up actions and special abilities that players use to achieve their aims. Those aims depend upon which faction each player is randomly, and secretly, assigned to at the start of the game. The Restorationists seek to assassinate the Great Old Ones with suicide dynamiters, while the Loyalists hunt down the Restorationist agents when they reveal themselves through their actions. The game is partly a free-for-all, with each player earning personal victory points, but with a wide range of strategies for stifling your opponents depending on your faction and which faction you think they might be on. A major downside is that this is not a game that can be jumped into quickly. The lengthy (though pleasingly coherent) rules really do need to be understood by all the players before starting a game. On the positive side, the game can be brutally swift meaning that two or three games can be played in an evening, each with a new set of identities for the players and new figures to influence. This is a strategic and varied game, and worth looking out for if you’re after something a little different.